It has been a while since we have been back here and what better reason to make the trip than my birthday. D hadn't told me where we were going. He had just told me to be ready for 6h30 and then at six, told me to meet him at Burrard and Smithe. I knew where we were going right away. Well, though he tried to joke that we were going to Japadog that has a cart right there, he stopped when I tried to order. Le Crocodile is a bit of an institution for uncompromising French cuisine in Vancouver. Whilst all it's peers have meandered carefully into fusion or lighter offerings, le Crocodile would never make such concessions. All sauces are full fat, full butter, full on. It's not enough to say, come hungry. Rather I would say, come skinny. The setting is a tranquil and chic, yet possibly becoming dated, iconic French restaurant setting. It's a minor thing but I like the fact that the majority of the staff are French or Quebecois. The one thing that bothered D more than I, surprisingly was the enormous floral arrangement which dominates the centre of the dining area. He found the aroma a bit suffocating. Grandma's bathroom floral, he put it. We were given a small Tartlette with a Tomato Concasse amuse bouche as well as warm bread which I had to hold myself back from continuing to nosh at. We also received a small mound of matchstick fine Pommes Frites. We're not certain if they accompanied either of our starters but they were lovely and filling! My starter was something that I will always order if I see it on a menu. I don't know why we don't do them at home. There is always a reason I don't pick some up at the fish mongers, Escargots. I adore them. I forced my sister to try them once after much cajoling. She wasn't terribly enthused by the texture and commented that they were basically a vehicle for Garlic Butter. Perhaps that's partially true. I am quite sensitive to texture and it's never bothered me, particularly if they are not over cooked. Whilst Garlic does normally dominate the the classic serving, the Escargots themselves have a nice mild earthy flavour too. Le Crocodile serves theirs in a small pastry shell. It carries just enough Butter with the Escargot on the journey to your mouth. You could try to scoop more into the cup but it magically doles out just the right amount. So the bread I had saved to dunk with my fork to pick up the Escargot was not needed :^D. D had a Frisee salad with Lobster Tempura. Lightly dressed with heaping large pieced of Lobster. Quite a substantial serving. It is hard to do a nice delicate Tempura with something like Lobster. I had the same Tempura on my main and found the Tempura slightly oily, slightly and the Lobster over cooked. For my main, I had the Halibut on Fettucini in a Saffron infused Beurre Blanc sauce topped with Lobster Tempura. In retrospect, this was a horrible choice following Escargot. I hit my surfeit of butter half way through my Escargot. The Beurre Blanc sauce was incredibly rich and too too heavy. The pasta itself was gorgeous and perfectly cooked but there was far too much sauce. The Halibut was slighty over cooked, slightly and under seasoned. The portion was enormous. I had to take some home. I hadn't even considered it since I almost never do it. But our server offered. If you go to their website my dish is on the screen with the menu. The piece of Halibut I received was twice that size. Though it was a Monday, it was not by any means slow and I do not believe they were 'clearing'. D ordered the Roasted Chicken. His sauce as well as a bit heavy but not overly so. The bird was roasted very well and the accompaniements were lovely as well as generous. The risotto was on the 'soft side'. D had wanted to order a lighter fish dish. He ordered the Sea Breem since the only other fish dish was the Chilean Sea Bass. We were both taken aback to see this on the menu since it is on the endangered, do not fish list by Oceanwise. We even verified with the chef that it was indeed Chilean. Alas it was so D ordered the Sea Breem. Our waiter came back, regrettably, to tell us that Sea Breem was not available and actually had not been available for over a month. We found it odd that 1. He would admit that too us. 2 That they hadn't re-printed the paper inserts in the menus. I think the few years of living and eating in Vancouver or perhaps, generally in this day and age, we find so much rich food hard to take all at once. That said, it is a lovely treat to eat there. There are so few places where you feel you're treating yourself to a nice elegant dinner. But like I said, come skinny or order 'intelligently' from end to end. If you have ever lived in the Bay Area, renown for the high per capita gastronomic purveyors, you will likely know of a pizzeria who's name sounds like a highway. It is famous for number of their dishes beyond their pizzas. One of particular note is their Meatballs. After much research, D found an approximation of their recipe on line. I had mentioned to D recently that I hadn't had a meatball in a couple of decades and even then, it was either out of a can or at the Hut on a school trip. He seized the suggestion. He did make a few adjustments for his quarterly make-J-eat-meat challenge to make it slightly more palatable for me. The result was surprising, comforting and tasty. Though I will admit, still to 'meaty' for me. I would recommend them to all carnivores out there. I mean really, the fact that I got through two is huge! And D, suffered happily through the other dozen and a half. They freeze well. Some of you regulars will know I do not like meat. Cafo's and over crowded egg factories aside, I have no real moral objection to meat eating per se. I just do not like the taste, particularly the taste of fat. I grew up eating Korean meat dishes which meant: highly flavoured and cooked through. You would never or rarely see medium Kalbi. No. We like the candied char. MMMM So I just gave it all up since I was easier than being overly picky. Now I'm extra sensitive to it to a point, I'm not too great with the Korean stuff either. Given this back drop, which I have had to repeat to D after his first, 'miss' on the challenge, he's risen to the parameters of success: Drain all fat, pick low fat meat, do not even attempt 'naked' meat at this stage and the more aromatics the better. So far, he's batting .300. Again! I want to emphasise that these are good meatballs but just missed the vegetarian conversion mark. One thing I did suggest is that he make them smaller so I would have more browned surface area but they do braise for a long time so you'd have to be careful not to turn it in to a bolognese. Mix the Turkey with Salt, Chile flakes, Fennel Seed, and Herbs. Add the Onions, Garlic, Parsley, and Parmesan. Ideally you should do this by hand wearing gloves or really clean hands. Put the Bread in a food processor; process until finely crumbled like sand. Add the Bread Crumbs and Ricotta to the Turkey; mix by hand. Add milk to achieve a moist, soft texture. Beat the Eggs lightly in a bowl and then add to the mixture. Mix until Eggs are barely incorporated. Don’t overmix. Form into balls 3T sized balls (size of an average plum, though I'd go smaller). Heat a large dutch oven with Olive Oil, fry until golden brown all over. Remove from dish, drain all fat well, and place the Balls back in to the dutch oven to braise in your choice of sauce (See Below) for 2-3 hours. Allow to cool in the sauce slightly before serving. Serve over Pasta with more Parmesan. Soak the Porcini Mushrooms in 1 cup of heated Broth until for about 30 minutes. Strain the liquid through a fine sieve. You could use cheesecloth if you're fussed but if you're careful about the sediment on the bottom, you won't need to bother. Set the Porcini aside and reserve the liquid. In the empty dutch oven, with the Turkey Balls set aside, drain all the fat, heat and add 1-2 T of Olive Oil. Add the Onions, Carrots, and Celery, sautee until soft and golden, 3-5 minutes. Add the Garlic and stir for 1 minute, don't brown too much. It goes bitter fast. Stir in Bay Leaves, Rosemary, Parsley, and Tomato paste. Add the Wine and gently simmer about 20 minutes until reduced by about half. Add the Tomatoes, Porcini Mushrooms, Mushroom Liquid. Bring to a simmer then add the Turkey Balls. Add enough Vegetable Broth to almost cover the Turkey Balls. Braise in the oven as above for 2-3 hours. D always bakes my birthday cake, well dessert. I have 2 favourite desserts. Desserts of the sort that no matter how full I am, if we are out for dinner, if they appear on the menu, I will order. Those treasured desserts of Tiramisu and a nice fluffy NY Style baked Cheesecake. D's Tiramisu, with generous layers of Marscapone, is also awesome. Though lately, I have been lamenting that I cannot find a decent Cheesecake in Vancouver. There is definitely a dearth of dessert specialty spots here. Odd. And the majority of the cheesecakes are the dense, heavy 1-1.5 inch types. I really like the creamy yet fluffy and TALL, baked variety. MMMMM. Preheat the oven to 325 F. Boil a kettle full of water. In a food processor, pulse the cookies until they reach the consistency of sand. In a large bowl, combine the Cookies, Butter and Cinnamon with a fork until evenly moistened. This is alot of crush. D and I love alot of crust. Butter the bottom and sides of a 8-inch springform pan. Cut out a piece of parchment paper and Butter as well. Pour the crust into the pan and press the crust as evenly as you can with your fingers all the way up the sides of the pan and press into the bottom as well. D always feels cheated on crust so he quite deliberately makes extra crust. Refrigerate for 5 minutes to firm slightly. When dealing with Cream Cheese, I highly recommend you use a mixer or a beater. In the mixing bowl, beat the Cream Cheese on low until fairly smooth, 1-2 minutes. Add the Eggs 1 at a time. Continue mixing until mixed evenly. Gradually add the Sugar and beat until creamy, 1 to 2 minutes. Add the Sour Cream, Lemon Zest, and Vanilla seeds. You may to occasionally stop the mixer to scrape down the sides of the bowl and the beaters. Do not over work. Place the springform pan in the centre of a large piece of Heavy Duty aluminum foil. Press the foil up tightly against the pan. Pour the filling into the crust-lined pan and smooth the top with a spatula. Place the cake in centre of a large roasting pan. I suggest you place the roasting pan in the oven first and then place the cake in the pan. Pour boiling water into the roasting pan until the water is about halfway up the sides of the cheesecake pan BUT not higher than the level of the foil. The foil should prevent the water from seeping in the joints of the springform pan bottom. The water should promote even cooking and not hot spots common to ovens. Bake for 90 minutes until the top starts to look like it is at least starting to congeal and does not look like or move like pudding on top. As well, it will start to brown slightly. There could be 15 minutes on either side of 90 minutes depending on your oven. The cheesecake will still jiggle when it comes out and will continue firm up. So try not to be tempted to overcook. Let cool in pan in water bath for 30 minutes with the oven door open. When the cake is about room temperature or comfortable to touch, chill in the refrigerator, loosely covered, for at least 4 hours. I use a pot lid. Loosen the cheesecake from the sides of the pan by running a thin spatula around the edge of the pan. Unlatch and carefuly lift the side up and off and transfer to a cake plate. Slice the cheesecake with a thin, non-serrated knife that has been dipped in hot water before each cut. We used our refridgerator Blueberry Jam as a compote on top. It was a simple reduction of Blueberries, Sugar, Lemon Juice and Zest and Pectin. Warm slightly before topping your cake. My sisters have accused me of having AADD, Adult Attention Deficit Disorder. I prefer to call it a penchant for multitasking. In any case, even for me, the fall gets very harry to maintain the blog with as much frequency as I'm taking my photos and recipe notes. I will have to post the dinner that D made me for my Birthday Dinner last Monday. He topped it off with his famous Cheesecake, topped with some Blueberry Freezer jam we made in the summer. Watch for it! Having eaten a slice every day this week, I can end the lament that I have not found a good New York style Cheesecake in Vancouver. Instead of backtracking on my posts, I thought I'd post this mornings baking. It snowed last night. When it gets this cold in Canada, it makes me need to do two things: Knit or Bake. I used to knit alot more than I do now but I nearly gave myself carpal tunnel one year when I went on a marathon knitting session to complete a ski sweater. I don't like leaving jobs have done. So now I stick to quick projects. Anyone need a hat? This morning, I took out the needles but decided I needed breakfast first. Given that I've been eating so much Cheesecake lately I decided I needed some Oats to help deplete my saturate fats and cholesteral. I was going to make Pancakes but flipping through my notes and books, could not land on one I could knock out in under half an hour and sit down to without continual stovetop action. Nothing wrong with it. But D slept in and we usually tag team on breakfasts like that. These muffins are the Lemoniest Muffins, seriously. They have a texture and richness which is closer to Scones than a typical Muffin. So Yummo! Melt the Butter in a microwave safe bowl. Let cool slightly. Use a Brush use some of the butter to grease your pan. Set the rest of Butter aside. In your mini processor (ours is a handheld attachment), pulverise (great word!) the Oats. In a large mixing bowl, mix the Flour, Oats, Sugar, Baking Powder and Lemon Zest with a fork. Microwave your lemons for 30s, for 2 reasons. It helps them juice better and it will help the melted Butter from congealing when you combine them. Measure the Lemon juice before adding it to the Butter. It is your liquid so you do need the 1/2 c. Add the Lemon Juice, Eggs, Salt, and Milk to the melted Butter. Mix well. It will be quite thick and lumpy. Just mix until all dry is incorporated. The Cake Flour and Lemon Juice should help prevent gluten forming but still, you do not want to over beat if you can help it. Spoon into your tins. Fill only 3/4 full. Bake for 20-25 minutes. They will not brown too much on top, but that's okay. If you're a zealot of browned tops, you could broil it on low for 3 minutes. I like to have a handful of reliable tasty restaurants in sleeping-walking distance from home. You have to have a go-to Sushi, Indian, Thai, Burger and Chinese place, I think. Having Korean is a bonus but normally a let down for me. We have quite a few but lately our Thai place has been letting me down so I was chuffed when I saw Joyful Kitchen opened. Often enough SE Asian places, even Thai, tend to have cross over into Malaysian, Thai, Indonesian and Singaporean foods. It's not ideal though a darn sight better than the ones that include western and european in that mix. Anyhoo, I wanted a new reliable Thai/Indo noodle place so we tried it out during their first week of opening. The first thing that struck me is the retro (in a sad way) decor. There were plastic plants and Christmas lights everywhere. Still, if the food is good, I don't care. We were greeted by an eager server which was well expected for opening week. Though they were friendly, I felt like they were feeling their way around how attentive they 'should' be. We ordered a few dishes all of which I thought were staple dishes for the genre and should be easy to get right. We had the Spicy Crab, Seafood Rice Noodle, Green Beans with Sambal and Coconut Rice. The only thing we liked was the Coconut rice though it was a rather small portion. The Spicy Softshell Crab was not very spicy and a little slimey. It lacked depth of flavour. The crab itself did not have a great deal of meat. If it tells you anything, D and I did not fight over the last piece. The Green Beans were either not fresh or over cooked. Dry and not as spicy as you would expect from Sambal. Green Beans! How do you get Green Beans wrong? The noodles, were dreadful. I love the broad, flat noodles but these were so greasy and slimey, even the most adept at a fork let alone chopsticks would struggle to pick them up. It was meant to be a Seafood Noodle dish and it had a very VERY pungent Chickeny aroma and taste that not even a big heaping mound of hot sauce could mask. I found it very difficult to eat. Actually there was no sauce, which I found confusing because it was described as having flavourful sauce. It was just thickened Chicken broth. The noodles were less affected but I suspect the Broccoli was cooked in Chicken broth, but not only Chicken broth, funky Chicken broth. We barely touched it. I took it home thinking if I had it for lunch doused in Soy and Hoisin it would be better. It was NOT. Normally, I can make between visits home to mom and dad a couple times a year, to have some good ol Korean food. Of course, during other years, we tend to have a larger stash of frozen goodies my mom always stows away in our luggage. Alas, not so this year. This year, mom sent home more 'meaty' goodness for D and less J friendly yumminess. We decided to go up the road to the large Korean restaurant on Broadway. We'd been there once before for Sunday brunch. It wasn't great but buffet brunches hardly ever are. We thought or rather hoped the a la cart menu would be better. As is the case with the ubiquitous sushi in Vancouver, Korean food is equally easily accessible. This leaves a very wide gamut of quality. It is that much harder when you're very accustomed to scratch cooking. 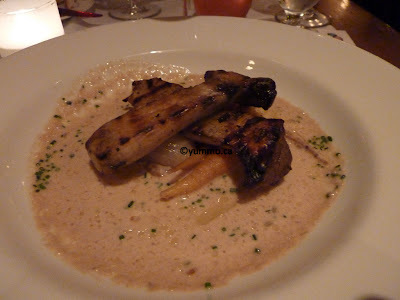 Watery broths, muted flavours and toned down spices to accomodate more timid palates is very common. Korean food is VERY bold. For those who expect something like Chinese food or Japanese food are frequently surprised. I have had alot of boring Jja Jjang Myun (Korean Blackbean Noodles) and bland Kimchee Chigae (Kimchee Stew) in these compromising restaurants. Royal Seoul Restaurant fell into this disappointing category which was further aggravated by irksome shortcuts. The original reason I really wanted Korean this week was because I had a big craving for Jja Jjang Myun. It is a Rice Noodle dish served with a Korean Blackbean sauce. The Korean version of this sauce is notably different from the Chinese. It is equally espresso dark in colour but the Korean one has a smoother and consistent texture. As well, the Korean sauce has a gentler more round flavour than the jagged saltiness of the Chinese cousin (which I like as well). The sauce normally contains, Onions, Peas, Potatoes and a protein. The protein is more often than not, Pork but mom has been making it for years with Seafood. In many restaurants you can order it with Seafood only. In fact, if the restaurant is not making any shortcuts, you should be able to make it to order with Seafood only. I once ordered Seafood Jja Jjang Myun at Da Rae near Burnaby and it came with Seafood added TO the minced Pork! Anyhoo, Royal Seoul House did not have Seafood only option which tells me that they likely make a big vat of it for the day (or possibly more) and just serve it. Disappointing. So I ordered the Soon Dubu Chigae and D ordered the Yuk Kae Jang. We started with the Korean Seafood Pancake to start first. The two stews came with 3 Ban Chan a piece, Korean 'condiments' but we only got 5. :^( Oh well, we started with the pancake. It had alot of seafood though skimpy on the scallions and any other veg like say shredded carrot. It was also incredibly Oily and slightl too Eggy. Soon Dubu Chigae is a stew served in a stone bowl. Soon Dubu is fresh dubu or tofu. It has a silken texture. The stew is spicy and flavourful; either a Milchee (dried Anchovy) broth or Beef Broth. In a good Soon Dubu joint, the bowls are searingly hot so it is still bubbling when you are served. Or if you order a Bibimbap the rice forms a crust on the side of the bowl and you finish the stew at the end by added boiling rice or tea to loosen the Rice. MMMM. The stone bowl here was mildly wam to the touch. There was a good amount of Dubu but the broth.... blech. It tasted INSTANT, you know that ragged, salty flavour you might get in a cheap instant ramen? That's what the broth tasted like. Sad. D's Yuk Kae Jang was a Shredded Beef stew in a spicy broth. His did not only taste instant but it was watery, very watery and not at all spicy. He also lamented the small amount of meat in the stew as well. Perhaps, mom has spoiled him as well with her broths always made from scratch the day of and generous amounts of veg and meat in her meals. But really, there are better Korean restaurants out there that wouldn't take such tasteless shortcuts. The penchant for shortcuts is also evident in the fact that they have moved to Buffet only on Weekday evenings. They do have at table BBQ stations which smelled right. Though it is hard not to do that right unless you use low quality beef, sauces and/or you don't have a clue. Because you can't take shortcuts on stuff like Bulgogi or Kalbi without it it being inedible. So if you're looking for a bit of a kitschy meal, go for the BBQ. The decor.... hmmm. Well, they tried to make it look authentic or rather, in my opinion, what they think Westerners would think is authentic. The walls and booths have that papered pane look. There are traditional Kimchee jars in the windows with old style lamps. They could have left it there but no. Every spare wall was plastered with a Korean poster of some sort of tat like Soju or Dishwasher. Was this meant to make me feel like I was in Korea? The best Soon Dubu place I've been to in Toronto looks like anyone's kitchen and water is served in plastic pitchers and the food is YUMMO, and that's the point right? Saturday, Oct 23rd - Blueberry Banana Lemon Nut Bread - So Yummo! I had a craving and D had a freezer capacity issue so this was a very symbiotic baking session. We still have at least 30% our freezer occupied by our blueberry freezing bonanza and we were reaching critical mass on brown bananas in there as well. D generally doesn't do the baking, I do but when it comes to quick breads, well, he claims the title in the house. Admittedly, he messed up slightly on the flour by using Bread flour instead of Cake flour as an experiment. He meant to try the lighter more tender flour and had the mental burp in his head on the naming. In the recipe, I just specify All Purpose but you could try what he had meant to, and use cake. D did figure out that bread was a mistake before he added too much. It was delicious nonetheless. In a mixer with the paddle attachement, cream Sugar and Butter well combined and fluffy in appearance. Add the Eggs one at a time as each get's absorbed. Add the Lemon stuffs and Vanilla. Lower the spead to stir and add the Bananas (already mashed). On the side in a bowl, toss Blueberries in 1 T Flour until lightly coated. In that same bowl, add the Nuts, Flours, Salt, Baking Powder and Baking Soda and mix gently so as not to pierce or smush the berries. Take the mixing bowl off the mixer and with a nice big wooden spoon or big spatula, gently mix in the Blueberry and Flour mixture. Nothing worse to me than blue streaks in blueberry baking, like those purple muffins in the Magic Bullet infomercials. Do not over mix or your bread will be tough. Pour into Buttered non-stick loaf pan. You can flour the pan if you must. I do not. Bake for 55-60 minutes. Test the centre with a wooden toothpick or skewer for doness. Crumbs are good, goo is not done. We got this idea originally from one of our favourite cookbooks. That said, I have been making Ratatouille since I became a vegetarian nearly 20 years ago so I really did not need someone else's recipe for Ratatouille. I'm not saying mine is better but it's better for me and I can mostly do it without thinking. As well, I've always thought of the dish as a slow cooked, melded flavours dish, and the cookbook we were inspired by had a stew time of 8-10 minutes. So I stuck with my own and took the inspiration only. The great thing about this idea is that you can make a nice large batch of Ratatouille or any nice chunky Vegetarian stew and serve up this way the next day as well with the eggs cooked only on the day of eating. Now, we have done this dish as described in the cookbook by placing a serving of Ratatouille into an ovenproof dish breaking the egg into a nest formed into the stew. Then bake the lot in the oven. It works alright though for me, it's not the most aesthetic serving. The egg is formless and not evenly cooked. So this time, I poached the eggs for 4 minutes in advance then finished it in the oven to slightly brown the top. In a large dutch oven, heat half the Olive Oil on Medium High heat. Add the Vegetables in this suggested order 3 minutes apart, stirring frequently: Onion, Eggplant, Zucchini, Bell Pepper. Add additional Oil if the bottom starts to dry out. The Eggplant will absorb Oil like a sponge so be sure to drizzle Oil evenly over everything. Add the Garlic but do not over brown. The Garlic should be followed in 1-2 minutes by the Wine. You can choose to either run a sharp knife around the inside of the tin to break up the Tomatoes or what I prefer, pour into the pot and smush them with your clean hands or to be safer into a bowl first then add them to the pot. Add the Water and Broth and Herbs and Spices. Mix thoroughly. Once it comes to a bubble, turn down to Medium, to Medium Low and cover. Let simmer for at least 20-30 minutes. Season to taste. You can at this point choose the break the Egg into the dished 1-2 c Ratatouille and bake for 10-15 minutes, depending on how you like your eggs. Or if you have time, Poach the eggs for 4 minutes and bake for 5-10 minutes. Lightly salt the egg before serving. A mere, tiny pinch. We were very fortunate to be treated to dinner by some friends to celebrate our making it legit earlier this summer. We were not at all expecting it. We often make plans to these event dinners particularly if there is wine tasting paired with it. The meal started with a Fresh Tomato soup. It was unanimously agreed that it was an odd addition to the set menu though. It was slightly too acidic and not well rounded as compared to the rest of the meal. The second course was a gorgeous housemade Gnocchi in a Beet puree. 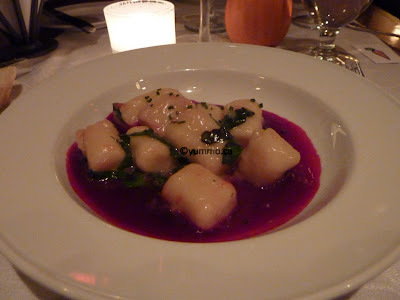 The Gnocchi were little pillows, little fluffy, light as air, down pillows. For a starter, the portion was quite considerable. You really cannot beat, homemade or housemade gnocchi. Store bought or deli fresh simply does not compare. 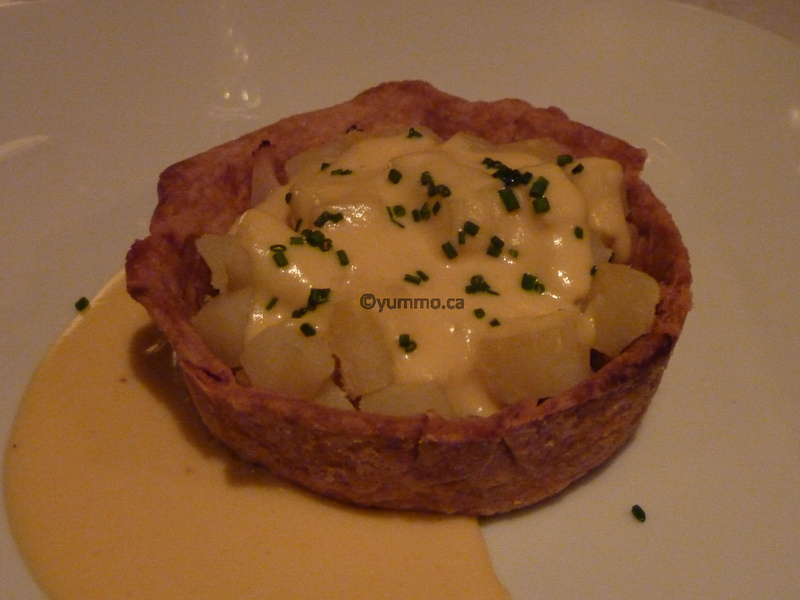 My second course was a Potato Tart. The first thing I noted was how lovely the crust was. V pointed out that the restaurant started off as the pastry shop, next door and expanded. So their pastries are definitely not outsourced or an afterthought. The potato was slightly dry and a bit heavy after the Gnocchi but I could not stop eating that crust. My main was a Grilled King Oyster Mushroom and the carnvores' main was Venison. Both were cooked well and well seasoned. They are not on their regular menu so suffice it to say that the kitchen is well coordinated, thoughtful and does not have a heavy salting fingers. It's neatly tucked away in Kits on the ridge and if not for the recommend, I'm not sure I would have come across it but I would definitely return. I will certainly make a point of visiting their pastry shop next door. I'm still drooling thinking about their Pate Brise on both my Potato Tart and Dessert.